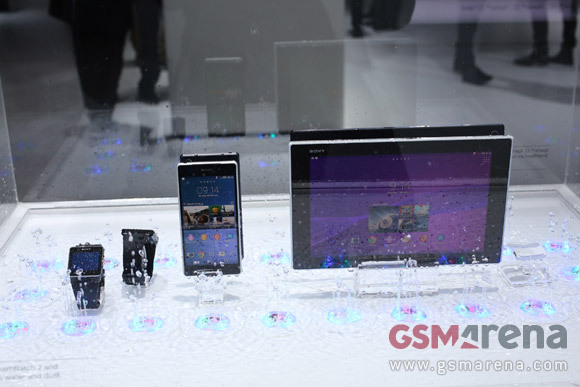 The Sony Xperia Z2 takes after the Z1 (which is to say it looks hot), but it has a larger screen – a 5.2" Triluminos display. The display has 1080p resolution, despite all the rumors of QHD screens at the MWC. The sharpness is great though and Sony has used the same tech for the screen as it does for its TVs. The camera features a 20.7MP Exmor RS sensor and Sony has finally enabled 4K video recording @ 30fps (aka 2160p). You can use digital zoom during video recording, but we've yet to see if it's as good as the Note 3's. Some new camera modes include 120fps slow-motion (at 720p resolution) and Background Defocus, and Vine is pre-installed. The Xperia Z2 runs Android 4.4.2 KitKat with Sony's customizations, which have gotten a reputation of minimal but functional changes to Android. 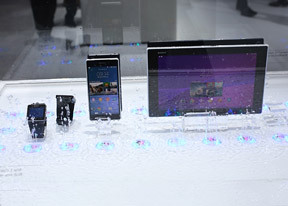 More interestingly, Sony uses Qualcomm's brand new Snapdragon 801 chipset – an improved version of the already fast 800. Sony's Z phones have never been the loudest round (the price to pay for water-proofing), but the Xperia Z2 features stereo speakers, so it might be better. The larger screen led to a slight increase in size but that's only in the vertical dimension, the Xperia Z2 is 2.4mm taller than the Z1, but a hair narrower and thinner. As before, the body has IP58 certification, so it can go as deep as 1.5m under water for half an hour.. The Sony Xperia Z2 comes with 16GB of built-in storage and a microSD card slot. The slots and ports are covered by flaps to prevent water damage. Speaking of ports, the microUSB 2.0 port features MHL and can output 4K video - now all you need is a 4K TV to watch the videos you've shot in their full glory. And we recorded a 4K video too. Here it is uploaded to YouTube, but you can also download it to avoid the extra compression. Keep in mind that your computer and video player need to be able to handle 4K video. If not, at least you can view the YouTube video at 1080p. We had just enough time with the Z2 to run several of our usual benchmarks - this is our first encounter with the Qualcomm Snapdragon 801, so we didn't know quite what to expect. The Xperia Z2 chipset is clocked at 2.3GHz and has 3GB of RAM, so it should do well against other flagships. It's worth pointing out the device is still a month away from store shelves. We will repeat the benchmarks once we get more time with the Xperia Z2, but the GPU performance is quite impressive. .